Over the past couple of months Pinterest has been going over a bit of a overhaul, including a new site design, and a new insightful analytics tool. There always seems to be tweaks and changes happening to all of the social media platforms, but I found these two updates for Pinterest to be the most important and beneficial to pinterest users and businesses. I love pinterest, and have since it first came out. The best part about pinterest to me, were the images and how easily you could see food, clothes, home decorations and anything you else pin. The new design has enhanced the images greatly in my opinion. They have removed the white space around each of the pins to allow for the pin images to be larger and has made a clearer layout of your newsfeed in general. They’ve also changed your profile page, its more condensed now, and is much more focused on each image, rather than the white space surrounding it. While these updates may look minor to some, to me and others who are on Pinterest all the time, it was very noticeable, and a welcome change. Bigger is better, and I am loving the new look with the bigger images, its much more inviting and easier to browse. 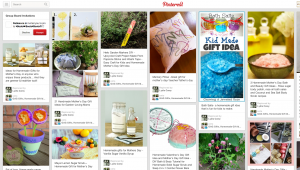 This update will also help brands and businesses who are imaged based get more business from Pinterest. The larger the images, and the indepth potential customers can see your products, the better. This is a nice change for businesses as well. In March, Pinterest introduced a new free analytics tool which allows users to “track he number of pinners and pins collecting material from their sites, and the number of repinners and repins those initial pins received.” Website owners can also track the number of impressions and reach on Pinterest, as well as referral traffic sent back to their website. This is all great data to have as a business owner. They can easily see what products and images are or are not doing well on Pinterest, and which ones are bring the most traffic to the website. Its great data to have for future reference so you can make sure you put the right products on Pinterest. Both of these updates have enhanced the user experience on the social media platform. Its important for businesses to see the type of traffic they are getting from such sites like Pinterest, and this new tool will make that a lot easier and provide reliable information.